I can’t believe the end of the month is already here. It’s time for another Character Spotlight and I’ve chosen one of my all-time favorites! Luigi was created as such so the Super Mario games could have a two-player option. They changed Mario’s color scheme, thus coming up with Luigi. He soon grew into his own character being deemed as Mario’s younger brother and developed a personality. He first appeared in the 1983 game Mario Bros. for the NES by Nintendo. In that game, however, there were no differences between him and Mario, other than their colors. He didn’t begin to come into his own until Super Mario Bros. 2 which came out in 1988 for the NES. He was slightly taller than Mario and was able to jump higher as well. Luigi was always one of my favorites because I felt as though he and I were alike. We’re both the younger sibling, we’re both “player two,” and we’re both afraid of our own shadows. I loved how he was always willing to help no matter how scared he was. Luigi’s Mansion, which came out in 2001 for the Nintendo Gamecube, is one of my favorite games ever. It’s a simple storyline and it’s a fairly quick and easy game to beat. But what I love most about it is the fact that Luigi is afraid of everything, but he still takes charge as the protagonist and fights to save his brother, who happens to always be the hero. Luigi is an all-around great guy and he is one of my favorite Nintendo characters. I love playing him any chance I get. 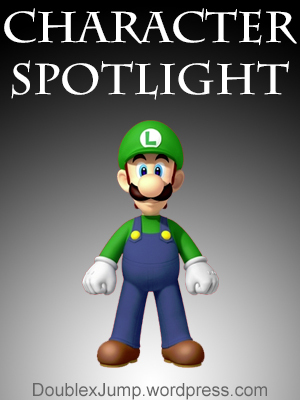 I thought I would do a fun mini-feature on the blog called “Character Spotlight” where I showcase some of my favorite characters from video games. Everyone, meet Fang. If you’re an Animal Crossing lover, I’m sure you’ve met him plenty of times before. I started playing Animal Crossing when it first came out on the Gamecube console. Fang was one of my villagers in the very first town I ever created. And I will never delete that town as long as he is there. He’s got a bit of an attitude, but he can be semi-pleasant to your main character. I don’t know why, but his cranky personality made me love him all the more. Let’s keep in mind that I was 13 when this game came out in late 2002. I visited him every day, talked to him all the time… I even wrote letters to him. Perhaps a few love letters here and there. Out of all the Animal Crossing villagers there are out there and all the video game characters, Fang will always have a special place in my heart. Who’s one of your favorite video game characters? Who is your favorite Animal Crossing villager?